Mud Room Workshops are designed to make individuals, working within an organizational structure, more productive, more creative and more valuable. Conducted on site, and tailored to fit your needs, these workshops use clay as the medium to cultivate and build creativity in your workplace. Mud Room Workshops foster CREATIVITY to be more PRODUCTIVE. The Mud Room Workshops are driven by the philosophy that all of us harbor creative impulses. In a non-threatening, fun format, participants are given very real, tangible opportunities to stimulate those impulses directly and exercise and stretch their creative muscles. Engaging, creative assignments are given along side technical instruction in making clay objects, such as a vase or a plate. Through participation, individuals become more engaged with the creative process. Knowledge of these "process" skills lay the ground work for the development of a creative practice, and participants will find that in cultivating a creative practice, they will have more ideas and more creative "horsepower" to tackle the day's business challenges. Mud Room Workshops foster TEAM BUILDING skills to increase capacity for COLLABORATION. The Mud Room Workshops teach participants how to use the creative process in collaboration with peers. Working in small groups of five or six people, participants are challenged to pursue both their own creative objectives as well as incorporate the suggestions and decisions of their colleagues. In this way, the Mud Room Workshops foster skills that integrate personal creative confidence with group innovation. These creative exercises generate techniques for working together more fluidly, with more mutual understanding and confidence in the collaborative process. Understanding the CREATIVE PROCESS serves as a rich source for SOLUTIONS. The Mud Room workshops encourage participants to find unique solutions. Removed from their daily work stations, and the tools typically used to solve problems, such as a computer or pencil, a shift in thinking occurs. While constructing a coil built vase that is able to stand unsupported, or creating a unique pattern to decorate a plate, participants engage an alternate thought process and engage different problem solving techniques. Through working in the tactile and immediate medium of clay, participants experience a shift in mindset that allows for a sense of openness to new ideas and solutions when returning to their desk or computers. 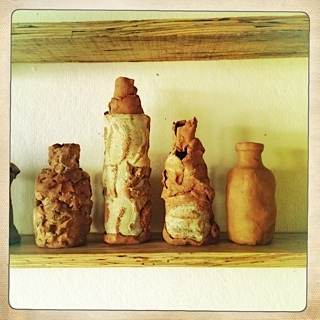 Clay workshops in your workplace are easy to conduct. We bring the clay studio to you. All materials and tools are brought in to your work place. The workshops can take place in a conference room, cafeteria, in any space that has tables and chairs. Materials are brought in and brought out before and after each class. Storage of materials and works in progress, as well as firings, occur off-site. Each participant finishes the workshop with at least one finished, fired ceramic piece. $375/person per workshop. Workshops span the course of 4 weeks, offering hour and a half classes once per week. Cost includes all materials, tools, instruction, firings and off-site storage of materials between classes. "THE ELEMENTS OF A STILL LIFE"
The Bottle and Vase are much explored ceramic forms. In this workshop you and your colleagues will explore the bottle or vase form, though coil built construction, focusing on how elegance of form works with function when creating a shape. Groups of participants will be asked to create a 'StillLife' collaboratively, and we will discuss composition, color theory and spatial relationships. Fun "homework" assignments may be suggested (visit Morandi's painting at the Legion of Honor.) Personal and collaborative creativity will be cultivated. End product: A finished bottle or vase of your own. Creating Sets of objects offers opportunity to investigate themes within multiples. Through slab-built construction, participants will press clay into plaster molds and create their own set of dessert plates. Techniques involve exploration of pattern and impressions, color theory and spatial relationships within the confines of a circle. Drawing with glaze pencils will address each plate as a canvas. Collaborative tasks will involve swapping plates within groups, and exploring formal, compositional elements within a set. Personal and collaborative creativity will be cultivated. End result: 1-4 finished dessert plates of your own.